Mahatma Gandhi preached a philosophy of nonviolence, understanding, and the search for truth. 67 years after Gandhi’s death, his grandson Arun Gandhi continues spreading that message of peace and carries on his legacy. The younger Gandhi grew up in South Africa under apartheid and faced constant prejudice because of the color of his skin. Like his grandfather, Gandhi is working to change the culture of violence. 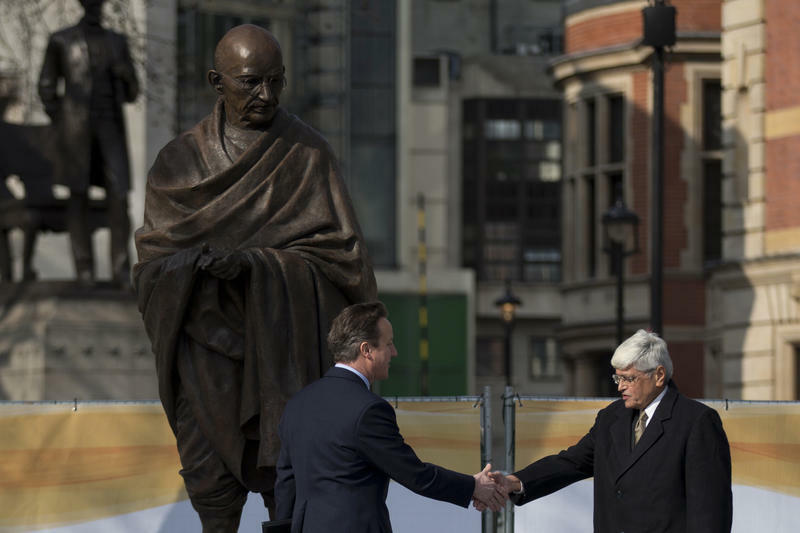 “We have got so trapped in the culture of violence that everything we do … is governed by that,” Gandhi said. To “become the change we wish to see in the world,” as his grandfather said, Gandhi started the Gandhi Worldwide Education Institute, which focuses on poverty alleviation through education, and the M.K. Gandhi Institute for Nonviolence, which focus on education about his grandfather’s philosophies of nonviolence. Both institutions work primarily with youths. The institutions also work with parents to help change the culture of violence and avoid planting the seeds violence in the minds of children. One strategy Gandhi says parents should adopt is practicing penance rather than punishment for misbehavior. 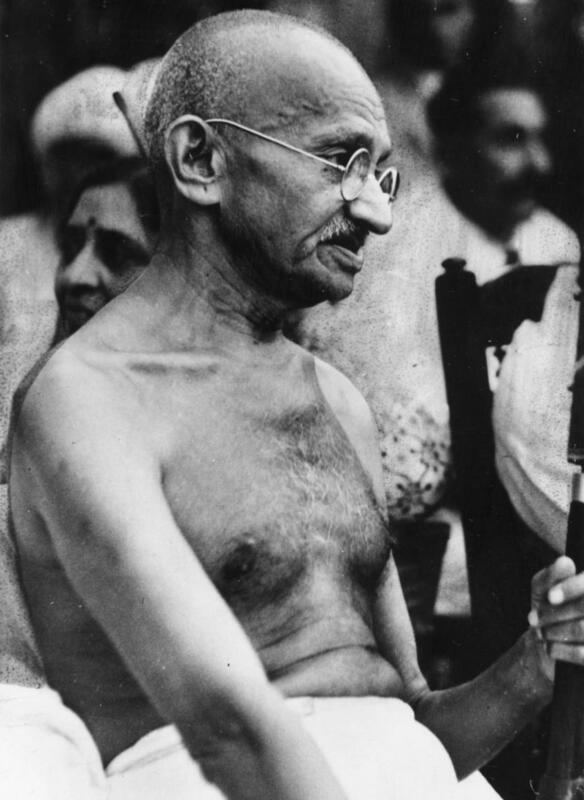 Gandhi acknowledges creating a culture of nonviolence is no small task, and seeing all the violence in the world today can be demoralizing, but those lessons he learned from his grandfather and parents help avoid a defeatist attitude. [My grandfather] said that relationships have to be built on positive principles of respect, understanding, acceptance, and appreciation. We have to respect each other and respect ourselves and respect our connection with all of creation. You know, we are not independent individuals – we are interdependent, interconnected, and we've got to respect that. And it's only when we respect that, that we'll understand who we are and what we are and why are we here on earth. And when we understand that, then we will be able to accept each other as human beings and not identify people by the labels we put upon ourselves. Today we have so many labels to identify people that we have forgotten that behind those labels there is a human being. And it's only when we are able to accept people as human beings, then we will be able to appreciate our own humanity. What happens is colloquially we say that when a person is angry, he is mad. And literally he is mad, because he's not in control of his mind; when he loses his temper he's just crazy. And to do something in that kind of state of mind is always going to be destructive. So it's important that we stop ourselves from acting in a moment of madness, take control of our mind, and think of the issue and not focus so much on the person, but on the problem and find a solution to that problem. For that, we need to have some mental capacity, mental exercises… And so when you get into a situation when you are angry and mad, then you don't flare up and you take control of your mind and move away from the situation if necessary. But do something to regain control of your mind and then find an adequate solution. Part of the philosophy of nonviolence [is to] become more conscious of people around us and the pain and agonies that they have to suffer. And so when I was kind of in a sense exiled to India, because the South African government wouldn't allow me to bring my Indian bride back with me to South Africa, I was forced to live in India. And when I saw all the poverty there, I realized that we need to do something to help these people get out of that cycle of poverty. And so my wife and I and some friends, we devoted our time to using grandfather's philosophy and trying to find adequate solutions. And those programs have been successful and they're now going on their own momentum and still bringing all the change in people's lives. Then, more recently, I started a program to rescue children who live in poverty. We still have millions of children in India – and all over the world, in fact, all over the developing world – there are millions and millions of children who live in extreme poverty who are unable to get out of that cycle. And I started this program to rescue these children, to train them and rehabilitate them so that they can come back into mainstream society, give them some education and hopefully equip them to become useful citizens. SUZETTE GRILLOT, HOST: Arun Gandhi, welcome to World Views. ARUN GANDHI: Thank you. Thank you for having me on your show. GRILLOT: Can you just tell us, first and foremost, what those lessons that you learned from your grandfather might be? GANDHI: Well I lived with him between the ages of 12 and 14. And I grew up in South Africa, where I suffered a lot prejudice because of the color of my skin, and it filled me with a lot of anger and rage, and I wanted eye-for-an-eye justice. And my grandfather, the first lesson he taught me was about understanding anger and being able to use the energy constructively and intelligently, rather than abusing it. What happens today is that we get angry and we abuse anger, and that creates violence, and we just get more and more into the culture of violence. And he taught me that anger is like electricity: it's just as useful and just as powerful, but only if we use it intelligently. But it can be just as deadly and destructive if we abuse it. So he showed me how to use anger intelligently and tried to resolve issues and so on, which led to the second question about relationships. Today our relationships are very bad because everybody is selfishly motivated. We all want to know what we are going to get out of a relationship and if we don't get anything out of it, why bother to cultivate a relationship? And that leads to all the conflicts that we face in life today. So he said that relationships have to be built on positive principles of respect, understanding, acceptance, and appreciation. We have to respect each other and respect ourselves and respect our connection with all of creation. You know, we are not independent individuals – we are interdependent, interconnected, and we've got to respect that. And it's only when we respect that, that we'll understand who we are and what we are and why are we here on earth. And when we understand that, then we will be able to accept each other as human beings and not identify people by the labels we put upon ourselves. Today we have so many labels to identify people that we have forgotten that behind those labels there is a human being. And it's only when we are able to accept people as human beings, then we will be able to appreciate our own humanity. GRILLOT: So you mentioned, using – this is such a great way that you put this, and that your grandfather put this – to use your anger, or your outrage, your resentment, these types of negative feelings, in a more positive way and, as you said, intelligently. Which would indicate that you're using your cognitive capabilities, that you're using reason, that you're using your brain, for lack of a better word. But we often find that we react passionately and emotionally to anger. I mean, it's a feeling, right? So when you say that justice should be sought in things like love, respect, that these are feelings that we have. So how do you make that transition from thinking about reacting in a respectful way or in a nonviolent way to some sort of violence, and stop that emotional, passionate response? GANDHI: Well that's true. What happens is colloquially we say that when a person is angry, he is mad. And literally he is mad, because he's not in control of his mind; when he loses his temper he's just crazy. And to do something in that kind of state of mind is always going to be destructive. So it's important that we stop ourselves from acting in a moment of madness, take control of our mind, and think of the issue and not focus so much on the person, but on the problem and find a solution to that problem. For that, we need to have some mental capacity, mental exercises. We do a lot of physical exercises to have a healthy and strong body, but we don't do any mental exercises to have a healthy and strong mind. And that is where meditation and learning to control your mind comes in very handy. What he [my grandfather] made me do was to hold in front of me a flower or a picture of somebody that I liked and for one minute I had to focus on that object and then shut my eyes and see for how long I could keep that image in my mind's eye. At the beginning, when I closed my eyes the image vanished. But when I began to do this exercise regularly, I found that could keep that image longer and longer. And to that extent, my mind was coming under my control. And so when you get into a situation when you are angry and mad, then you don't flare up and you take control of your mind and move away from the situation if necessary. But do something to regain control of your mind and then find an adequate solution. GRILLOT: That is very great advice, and very concrete advice that we can use to move forward. But I'd like to ask about some of the work you've done around the world on these issues. Obviously you're a sought-after speaker and somebody who's engaged in these types of activities, living out the life of an activist in promotion of nonviolence. But you've also gone back to India – even though you've spent most of time, your childhood, in South Africa – and have set up a lot social programs there helping millions of people. Tell us a little bit about the work you've been doing there and why you were drawn back to India. GANDHI: Well that was part of the philosophy of nonviolence, where we become more conscious of people around us and the pain and agonies that they have to suffer. And so when I was kind of in a sense exiled to India, because the South African government wouldn't allow me to bring my Indian bride back with me to South Africa, I was forced to live in India. And when I saw all the poverty there, I realized that we need to do something to help these people get out of that cycle of poverty. And so my wife and I and some friends, we devoted our time to using grandfather's philosophy and trying to find adequate solutions. And those programs have been successful and they're now going on their own momentum and still bringing all the change in people's lives. Then, more recently, I started a program to rescue children who live in poverty. We still have millions of children in India – and all over the world, in fact, all over the developing world – there are millions and millions of children who live in extreme poverty who are unable to get out of that cycle. And I started this program to rescue these children, to train them and rehabilitate them so that they can come back into mainstream society, give them some education and hopefully equip them to become useful citizens. GRILLOT: Well education has been a big part of your work in general. GRILLOT: You've started a couple of institutes: the M.K. Gandhi Institute for Nonviolence, which is actually centered in Memphis, Tennessee, as well as the Gandhi Worldwide Education Institute. And both of these institutes, and of course the work you're referring to in India, is very much motivated by educating others about these types of ways in which we can program ourselves and react in more constructive and helpful ways. But I thought it was interesting, at your Institute for Nonviolence in the United States, that you're prioritizing programming for people between the ages of 12 and 24. So you're focusing on young people and helping them, training them to have skills in nonviolent communication, in meditation, as you were mentioning, these very important, practical things you can do, interconnectedness and sustainability. So I believe it was founded in Tennessee, but then it moved to New York, right? It moved to Rochester. So tell us a little bit more about that particular project. And, obviously, the focus on youth, I would presume, is an effort to try influence the future generations of nonviolent activity. GANDHI: Exactly. The purpose of this institute was to make people aware that nonviolence is not just a tool to be used when convenient – it is about personal transformation. We have got so trapped in the culture of violence that everything we do – our language, our sports, our entertainment, our relationships – everything is governed by that culture of violence. And the only solution for this is to break out of that culture of violence and adopt a culture of nonviolence, which means that each one of us has to become the change that we wish to see in the world. So I am trying through this institute to influence young people that they can be the change in the world, that they can make a difference in this world and make it less violent. I won't say that we can create a utopian society where there won't be any violence, but we can certainly reduce the level of violence where we can all live in peace and harmony with each other. And part of the program is to take these students and even adults, whoever wants to come, on a Gandhi Legacy Tour of India where we go to various village and slum areas where individuals using Gandhi's philosophy of constructively bringing about a change in the lives of the poor people. And they study these programs for two weeks and go around the country and see them and learn from them how nonviolence can be used in everyday life to bring about small changes in the lives of people. So these are the programs, and as I said, the Gandhi Worldwide Education Institute was started more recently. And that is focused more on trying to help the children in poverty and trying to bring them out. And it has a very ambitious program. We wanted to have these kind of centers in all the developing parts of the world where there's extreme poverty, but that needs a lot of money and [laughs] we're struggling for money like everybody else. GRILLOT: Well you mentioned focusing on children, but you're also focusing on parents. That's an interesting part, is that parental involvement and the importance of how parents are raising their children is critical. GANDHI: Exactly. Violence is not our natural nature – it's something that we learn. And the way we learn it is the way we are brought up. And it's like, when a child misbehaves we punish the child. And that punishment is the first seeds of violence we are planting in the child's mind, and saying that anybody that misbehaves has to be punished. In a culture of nonviolence it's not punishment, it's penance that is important. And we were brought up in that kind of a nonviolent home and our parents didn't punish us when we misbehaved, they did penance. They fasted, depending on how serious the offense was they fasted half a day or full day or two days. But they would sit at the table, they would feed us and they would talk to us and they would tell us that they were not eating because they were not good parents and they didn't teach us the right way of behavior. And because the relationship between the parents and us children was based on mutual love and respect for each other, we felt awful when our parents had to do that and we made sure that we didn't do that again. So it's all of these things that combine: that love relationship between parents and children and then penance, teaching us nonviolent ways of dealing with situations and so on. GRILLOT: So, now that you've been working in this area – and obviously your background is remarkable and just the story you're telling right there about the importance of parents and how your parents raised you is just absolutely remarkable. But we still see a lot of violence around the world. You can't turn on the television without seeing what's going on around the world today. So how do you stay motivated? How do you stay focused and positive and optimistic about the work that you're doing? I think this would be really helpful for the rest of us to learn how to keep moving forward on this type of work when what you see often is so depressing and demoralizing. GANDHI: Well I think that's where my grandfather's advice and my parents' advice came in very handy when they said, "don't have high expectations. Don't think that you can change the whole world. But just do what you have to do and be happy with small changes that take place." My parents would always say that you should consider yourself to be a peace farmer. And just as a farmer goes out into the fields and plants seeds and hopes and prays that he gets a good crop, you just go out and plant seeds and hope and pray that those seeds will germinate and you get a good crop. GRILLOT: So you're living by example in many ways, but you obviously have to have the exposure to others in order to set that example and to demonstrate how to move forward. So engaging in some sort of broader community discussion is really necessary for that. GANDHI: Yes, it is. And whenever I get an opportunity like this – coming to a university and speaking to students, or radio and newspaper interviews – I take those opportunities and spread the word as much as possible. GRILLOT: Well we're so grateful that you've come here and very grateful for the work that you're doing. Today's times are very trying, as you know. GANDHI: It is. It is very trying and it is disheartening at times. GRILLOT: But it's important that we're having these conversations and the legacy, obviously, your grandfather left and your parents to you and the work that you're doing and that you're keeping this up. I hope that you feel that the legacy you're leaving is going to be carried on as well by those of us who are learning from you. GANDHI: Yes, I am hoping and praying that that happens. And I can see that happening in my children; my daughter and my son are both involved in it and they're carrying on the legacy so it won't die with me but it will continue. GRILLOT: Well we'll all be looking forward to hearing from you in the future and paying attention to the very important work that you're doing. And we thank you again for the work that you do, but also for being here with us on World Views. Thank you. GANDHI: Thank you very much for having me on the show. Mahatma Gandhi never won the Nobel Peace Prize. A lot of people who have dropped bombs, launched missiles and made war have won the Nobel, but not the man whose very silhouette — bald-headed, wrapped in cloth, and walking in sandals across a perilous world — is taken to be a symbol of peace across the globe. Winston Churchill once described Mohandas Gandhi, the Indian independence leader who challenged the might of the British empire, as a "seditious Middle Temple lawyer." On another occasion, he said Gandhi "ought to be lain bound hand and foot at the gates of Delhi, and then trampled on by an enormous elephant."